Having a good range of aquatic plants in your pond is essential for attracting a wide range of animal species. In extreme cases they can even kick start the local environment by creating a haven of insects that larger animals - such as birds, bats amphibians etc - can feed from. By selectively choosing native species over cultivated forms you can ensure that nectar levels and availability are optimal for the local wildlife. This also helps to create a more balanced ecosystem as well as providing important food sources over a longer period of time over the year. In addition to help oxygenate the water, these submerged pond plants perform other valuable functions. Firstly, they keep down the level of water soluble nutrients by absorbing them directly from the water. This in turn helps to reduce algae levels by conditioning the water and secondly, they can provide a shady refuge for frogs, toads and their spawn. They also help to support microscopic aquatic species and provide food for water snails. This is the 'engine room' of your wildlife pond. Marginal plants provide shelter, protect smaller creatures from predators, and cast shade upon the ponds surface. This reduces extremes of water temperature during the summer and helps to reduce algal blooms. They control concentrations of harmful soluble minerals by absorbing them through their root system for use as nutrients. Their flowers attract many native insect varieties and their seeds are a valuable source of food for overwintering birds and animals. Floating pond plants help to protect aquatic invertebrates. They also give plenty of shade, once again helping to reduce extremes in summer water temperatures and controlling problematical algal blooms. Reports from organizations Butterfly Conservation and the Centre for Ecology and Hydrology have highlighted the continuing decline of our native butterflies by measuring the changes in their distribution and population levels. Their findings show that populations are diminishing rapidly with over three quarters of our 59 resident species in decline and 5 others already extinct. These dramatic figures are blamed on the destruction and deterioration of ‘brown field’ and upland bog habitats. The report also highlights that our characteristic woodland butterflies are also disappearing due to traditional woodland management - notably coppicing – continuing to die out. It’s an alarming story, but by making a few changes to how we garden it’s possible to make a difference. Unfortunately, the biggest problem that any nectar loving insect has is that most heinous of plants – the modern hybrid! With the arrival of the Edwardian pleasure during the 1880’s non-edible gardens plants suddenly became fashionable as well as accessible. Then, in the wake of heroic Victorian plant hunters, the English garden was no longer viewed as a valuable source of food, herbs and medicines, but instead had become a place of peace and beauty. After millions of years of evolution flowers were not just a specialized body designed to attract pollinators, to Victorian eyes they had ascended to a thing of beauty. Unfortunately, to the up and coming career gardener they were also became something to be manipulated. Through years of selected breeding, plants which were once rich with scent and nectar had now become flamboyant and sterile ornaments. If proof were needed, compare the common dog rose alongside its multi-petal, modern day children. Even if there was any nectar to be gained from these over pampered Christmas decorations, there is no way that most insects could gain entry through its barricade of overproduced petals. Designed solely for the gardener’s vanity, these plants have no place in the wider environment. In fact if they were left to their own devices, many modern hybrids would disappear within a generation or two. Luckily for us, and more so nature at large, all is not lost. Even the smallest garden can become a haven for butterflies just so long as you keep to a few simple rules. Butterflies require a good supply of nectar throughout the year, they need it as a source of energy. You should select a variety of nectar-producing plants with the aim of providing flowers in bloom throughout the season. This will entice a continual succession of new visitors to your garden. It is especially important to have flowers in mid to late summer, when most of our native butterflies are active. If you have fruit trees in your garden then you may wish to keep an area for some over-ripe fruit. Plenty of species will be happy to feed directly off the fermenting fruit juices, although there may be some side effects. The majority of caterpillars feed on leaves; although some will develop on the reproductive parts of flowers or seeds. If there are not enough food sources at each of the butterfly’s developmental stage then they will perish. Systemic insecticides like Provado (Imidacloprid) can stay within the affected plants for up to 4 months. The active chemical is transported throughout the plant using its vascular system even reaching the pollen and nectar supply. One feed from an infected plant is generally enough to kill whatever insect fed from it. This is important to butterflies for a number of reasons. Butterflies prefer to feed and lay their eggs in warm sheltered areas where they are not at risk of being buffeted by strong gusts of winds. Preferring the warmth of the sun, neither do they like to stay in areas where they are at risk of being overly cooled by the wind. Male butterflies often make their way to “puddling” areas. These can include mud puddles, moist soil along stream banks, and animal faeces such a freshly laid cow pat. There they can ingest the salts important in sperm production. Create your own 'puddling' area for male butterflies by designing water puddles and wet, sandy areas into the habitat. You may wish to add a slight pinch of sea salt for extra mineral content. Throughout the growing season and in the autumn, resist the temptation to remove dead flower heads and foliage from your plants. 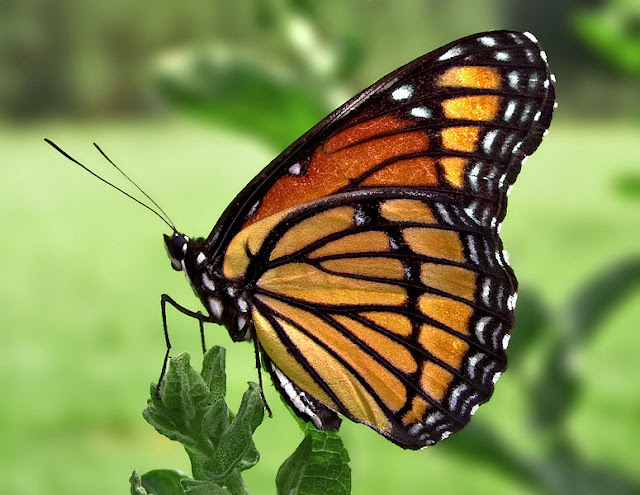 By doing so you may be accidentally be removing eggs or pupating butterflies. Due to global warming some butteries such as the red admiral can overwinter as adults. For these hardier varieties you may wish to provide log or brushwood piles for winter protection. To conclude, if we do nothing more than give the few butterflies that are left in the urban environment a fighting chance of survival then there is no reason why we shouldn't be around to see a stop in the decline of this most wonderful of species. However if we continue to put the needs of our vanity before the needs of our wild life then what else can we expect other than destruction of our own environment. The one thing we really do need to survive as a people. Butterfly populations have been in decline for decades now, mostly due to the destruction of their habitat. This has been brought about by changes in farming practices, increased usage of pesticides and a preference for gardeners to grow fancy plant cultivars with low nectar yields and often poor accessibility to the nectar itself. To survive butterflies need good access to food sources throughout their life cycle and there is plenty that even the most inexperienced gardener can do to help and it is all about planting the right plants. Also be aware that in season with low rainfall you will need to water nectar producing plants otherwise the nectar will effective 'dry out'. So to maintain a rich and available source of nectar throughout the year for our native butterflies there are some plants that you just can't be without. Planting the late flowering Buddleia is a popular choice allowing butterflies access to energy rich nectar before their long hibernation. Likewise, Arabis, Aubrieta, wallflowers and Polyanthus will all provide an early meal after they've awaken. This constant supply of nectar is imperative to reduce the decline of native butterfly populations, and so its important to try and provide a range of plants that will have at least some viable nectar producing flowers throughout the year. Look at planting a selection of these naturally strong floriferous plants such as Sedum spectabile - not the fancy cultivars, Honeysuckle, alyssum, Asters, Phlox, Rosemary, Hyssop, Lavender – especially Munstead, French marigolds , Hebe – particularly Great Orme and Mid-summer Beauty, Verbena bonariensis, Heliotrope, Echeveria (ice plant), Bergamot, and Marjoram. If they are available, try to plant native flowers that are common to your particular area. Getting in contact with your local conservation society can often bring about great advice, making the most of what your garden can do for your local butterfly populations. If this information isn't available to you then try planting the following varieties. Bird's foot Trefoil, Coltsfoot, Figwort, Lady's Bedstraw, Lesser Knapweed, Oxeye Daisy, Small Scabious, Sorrel, and Wild Clary. By maximising your gardens nectar yield our butterflies will have a much better chance of survival - not just for this year but for many years to come. But the effect doesn't just stop there. There are plenty of other nectar loving, pollinating insects which are just as much at risk from loss of habitat as their beautifully coloured cousins. Unfortunately, because they are not considered to be as pretty they often get overlooked, but when you read about population decline in their predators such as bats and insect eating birds it is easy to see that there are serious problems here too. With global warming and the subsequent changes in our environment it is normally down to the amateur gardener to express concern when they recognise changes in their local area. Once such cry has been about the steady decline of our native butterflies. Unfortunately it is all too often the same amateur gardener who is spraying their plants with systemic insecticides, killing off the caterpillars in the first place. No caterpillars, no butterflies- the maths is simple here. Unless we, as a gardening nation, make a concerted effort to actively encourage the feeding of caterpillars then many more of our 59 resident native species will die out. Five species have become extinct already! Below is a list of caterpillar food plants which if left pesticide free will help to encourage butterfly populations back into our gardens. All of these should be planted in a sunny, sheltered part of the garden for best effect. HOLLY- Ilex aquifolium. Along with our native ivy (Hedera helix) this is the larval food plant for the Holly blue. BUCKTHORN - Rhamnus cathartica .This is one of only two larval food plants for the Brimstone Butterfly caterpillar. The other plant is ALDER BUCKTHORN - Frangula alnus. The Brimstone is one of the few native butterflies that can fly as far as 15 miles looking for a buckthorn plant to lay its eggs on. By having one of these planted in the sunny part of your garden you will dramatically increase your chances of seeing this beautiful creature. STINGING NETTLE – Urtica dioica. Although unsightly and irritating the stinging nettle is perhaps one of the most popular larval food plants for many of our native butterflies. Species include the Small Tortoiseshell, Peacock, Red Admiral, Comma, the Painted lady butterfly, and Peacock butterfly. BIRD’S FOOT TREFOIL - Lotus corniculatus. This is one of the most important plants for any wildlife garden as not only it is the larval food plant of the Common Blue and Dingy Skipper butterflies it is also the larval food plant for several of our native moths. Plant it at the edge of your borders so that it isn't shaded by taller plants. COMMON SORREL - Rumex acetosa. This is the larval food plant for the Small Copper butterfly. It also attracts many other insects that in turn will provide food for our native insect eating birds, in particular the Spotted Flycatcher, Song thrush, Starling and House sparrow. CUCKOOFLOWER OR LADY’S SMOCK - Cardamine pratensis. This is the larval food plant for the Orange Tip butterfly. 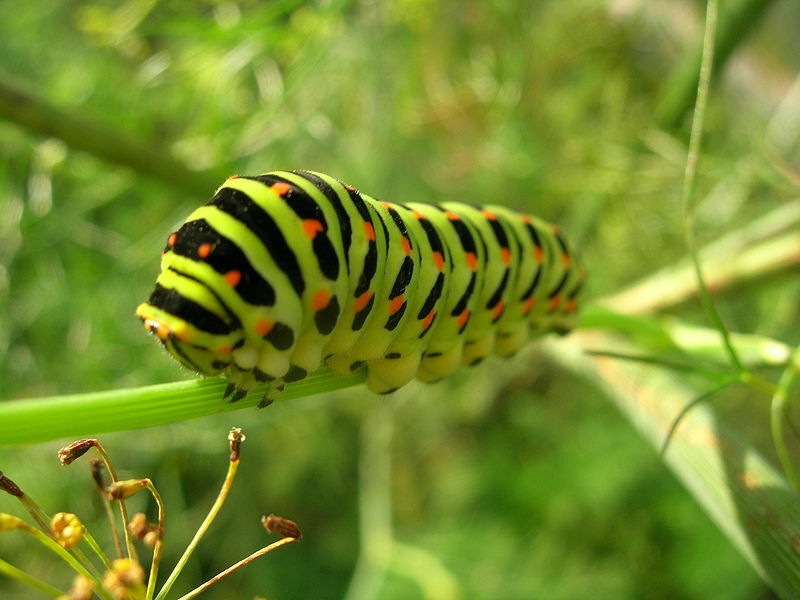 The caterpillars are also known to feed from garlic mustard, sweet rocket and honesty. DOG VIOLET - Viola riviniana. This is the larval food plant of many of our rare Fritillary butterflies. KIDNEY VETCH - Anthyllis vulneraria. This is the larval food plant of the rare Small Blue butterfly, and is also important nectar plant for other blues and bees. THE BRAMBLE - Rubus fruticosa. Its leaves are the larval food plant of several species of moth such as the buff arches, peach blossom and fox moths, while its flowers provide nectar and pollen for many insects including bumblebees, honey bees, hoverflies, wasps, butterflies, flies and lacewings. In addition it bears fruit in late summer and autumn for birds and small mammals. WILD GARLIC MUSTARD - Alliaria petiolata. This is the larval food plant for the Orange Tip butterfly. Although this list is by no means complete, but it is a good starting point for the butterfly gardener. With regards to insecticide use, if you find that you have a compulsive need to be using some kind of bug killer then may I recommend the ‘old wives' favourite of using soapy water in a spray bottle? Try and avoid the flowers and although this should have a minimal effect on visiting butterflies please remove any caterpillars that may be in the way as they can still be harmed. If you are keen to create a section of box hedging, or even push the boundaries and design an ornamental knot garden then one thing's for certain - you are going to need a substantial amount of box plants. Of course you can purchase what you need from your local garden centre but this creates two important issues. 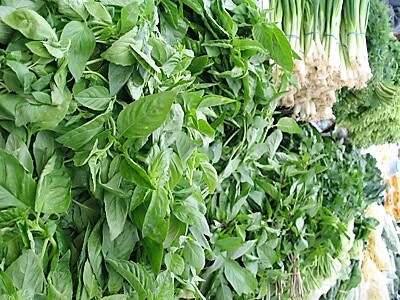 The first is the cost of purchasing such a large number of plants. The second is that to ensure an even rate of growth and colour so preferably you will need plants that have been propagated from the same parent plant. The best way to ensure that you have both enough plants as well as guaranteeing that they are all genetically identical is to produce your own box cuttings. The rather uninspiring period between autumn and winter is actually one of the best times of the year to take Box (Buxus sempervirens) cuttings. Before you even think of taking cuttings make sure that the parent plants chosen are perfectly healthy with glossy foliage clear of any fungal spots or discoloration, especially in light of box blight fungal infections. If possible water your parent plant the evening before to make sure that the leaves and stems are fully turgid, and aim to cut early the next morning preferably on a cool cloudy day. make sure that before cutting your blades have been properly sterilized. All you need to do is remove a strong healthy stem, about four inches long, from a healthy parent plant. Trim the base up to just below a couple of buds and then remove the lower two thirds of leaves. If you have a sandy soil in a sheltered site it's possible to place the box cuttings directly into the ground. Alternatively, use a terracotta pot filled with a good quality compost such as John Innes 'Seed and Cutting'. Push your cuttings into the compost at the side of the pot, spreading them evenly around the edge. Box cuttings do not require rooting hormone powder to initiate rooting. Label them and water with a dilute fungicide. Over-winter in a cold frame or cool greenhouse then come the spring plant them out into individual pots. Within a year or so you will have plants of an ideal size suitable for creating new box hedging. To conclude, not only would you be saving a small fortune from buying Box plants at your local nursery or garden centre, you will also have the satisfaction of knowing that you produced them yourself. If you have never come across a hummingbird hawk moth before then your first time may come as a bit of a shock, a pleasant one of course. The reason why is this, the hummingbird hawk moth is responsible for the largest number of mistaken identity cases of any animal within the British Isles. Unsurprisingly this would be the actual hummingbird. Unlike the majority of moths you would come across, this one is already unusual by being active during daylight hours. However it’s most unusual feature – and the reason behind it miss-identification - is the way it flies. It beats its wings so fast that they are no more than a blur, and like a true hummingbird they are able to hover whilst feeding for nectar with a long uncoiled proboscis. To complete the illusion, the speed of their beating wings is such that they emit the trademark hum from which the hummingbird gets its name. So how it has such an exotic species managed to find its way to our emerald shores. Abundant and resident in all Mediterranean countries, the Humming bird moth migratory habits are well documented with many thousands moving northwards in Europe during the spring. There is also evidence of a return migration in the autumn. Although they are known to successfully breed in this country, they are generally unable to survive our winters. This means that we are always reliant on new colonies coming up from southern France. To increase your chances of attracting the hummingbird moth to your garden, there are a number of plants that you can add to your borders that can help to encourage them. Of particular importance is the Galium verum, more commonly known as Lady's Bedstraw or Yellow Bedstraw. This is the plant that the adults prefer to lay their eggs on, although they have also been known to hatch on Centranthus, Stellaria and Epilobium. 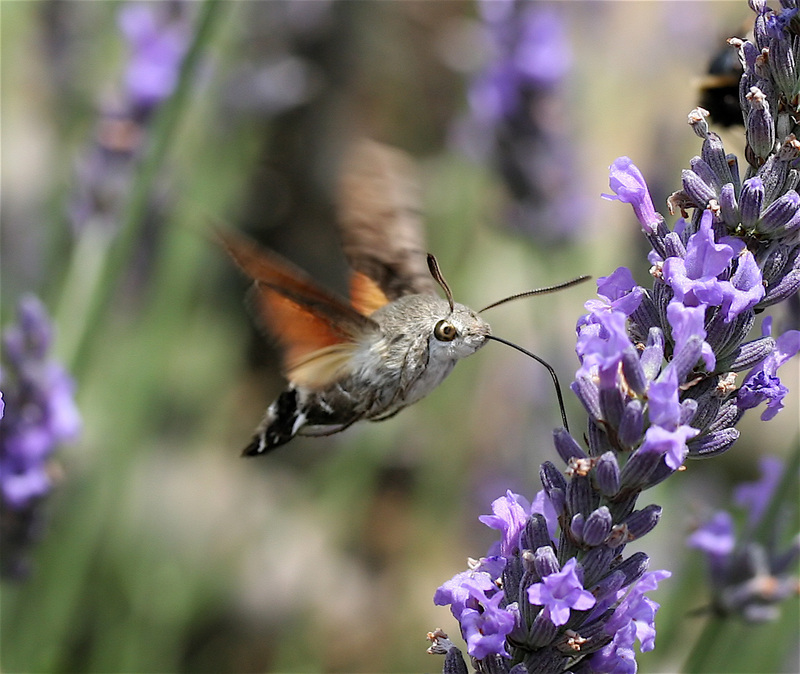 The hummingbird hawk moth is also known to have a remarkably good memory with individual moths returning to the same flower beds every day at about the same time. Again, by including in your borders the plants that they are known to be partial too, you can dramatically increase your chances of these moths visiting your area. Due to their high energy needs they are strongly attracted to flowers with a plentiful supply of nectar. These would include plants such as the single flowered petunias, honeysuckle, buddleia, red valerian, honeysuckle, jasmine, lilac, Escallonia, and phlox. Sedum spectabile is popular but not the fancy varieties as they don't produce enough nectar. Also consider, Nicotiana, native Primula and viola varieties, Syringa, herbaceous and bedding Verbena, Echium, and Stachys. Happy fishing! Anyone growing edible produce in their garden will know how important our native bees are in maximizing yields through cross pollination. However using systemic insecticides on any flowering plants can have catastrophic effects on local bee populations. Over the years the government has removed licensing for many of these indiscriminate products, but one that still remains is ‘Provado’ which notably contains the active ingredient Imidacloprid. Provado is predominantly marketed as a vine weevil killer, but will kill most insects that ingests it. What makes it worse is that it can remain active within the plant for up to three months at a time on a single application. However, when applied as a soil drench, Provado 'Vine weevil Killer 2' is an even bigger threat by remaining viable in the plant for up to four months. This lethal chemical is believed to be one of the factors in Colony Collapse Disorder in bee hives as it can be absorbed into both the nectar and pollen. Once collected, the contaminated nectar and pollen is taken back to the hives and passed on through the food chain killing yet more bees. With this kind of chemical progression and length of viability, it doesn't take long to exterminate an entire hive. 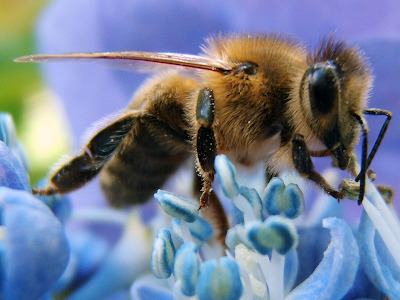 If the chances of a bee collecting pollen from a contaminated plant were the result of random searching, then perhaps there wouldn't be so much concern. Unfortunately research from both Greenwich University and University College London show that bees have a far more complex system of identifying and locking on to local nectar producing flowers than previously thought. Like humans, bees are sensitive to light at three different wavelengths (trichromatic). Also like humans, they can recognize the color of objects such as flowers even when their illumination changes (so-called color constancy). Dr Beau Lotto and Dr Martina Wicklein at the Institute of Ophthalmology have also shown that bees can identify a particular flower among a grid of 64 flowers when each is set on a black background. This is even possible when they are illuminated under four spatially distinct lights. This shows us that bees' color constancy abilities seem to hold true even in situations more complex than they would expect to encounter under normal field conditions. This enables bees' to easily identify a specific plant species solely from its particular color shade. Combined with their unique 'waggle dance' which is used to inform other worker bees the direction and distance of nectar rich grounds, you can easily end up with many worker bees from the same hive visiting the same patch of contaminated flowers day after day after day. With disturbing research such as this becoming ever more commonplace, the practice of gardening organically has never been so important. But more significantly, it carries strong evidence as to why the licences for Imidacloprid and any other similar product should be revoked. Picture yourself on a summer’s day, relaxing in a typical English garden. You'll probably summon images of butterflies and roses. Unfortunately the reality is somewhat different with most roses stunted and smothered with aphids, and as for butterflies - there probably won't be any. So why are our native butterflies becoming visibly scarcer. A recent report from the Butterfly Conservation claims that 93% of indigenous species are in decline. Climate change, loss of natural habitat, and pesticide use have all played their part, but we can make a difference right here in our own gardens. Planting the late flowering Buddleia is a popular choice, allowing butterflies access to energy rich nectar before their long hibernation. Likewise, Arabis, Aubrieta and Polyanthus will provide an early meal after they've awaken. A constant supply of nectar is required throughout the year and by planting strong flowering plants such as Sedum spectabile , Honeysuckle, Aster, Phlox, Rosemary, Hyssop, Lavender – especially Munstead, French marigolds , Hebe –particularly Great Orme and Mid-summer Beauty, Bergamot, and Marjoram, our butterflies will have a much better chance of survival. Keep plants well-watered during the summer otherwise nectar supplies can dry up, and avoid choosing ‘fancy’ doubled flowered hybrids as the extra petals can inhibit access to the nectar. However it’s not just butterflies that need our help it’s their caterpillars too, particularly as this part of their life cycle will be reliant on a different selection of plants. Unfortunately for those who are considering planting for larval and caterpillar stages, the plants of choice for many species are the bramble and stinging nettle! However, you may be able to tolerate small plantings of campion, garlic, mustard and dandelion in some hidden part of your garden. Don't forget, butterflies and their larvae are just as susceptible to chemical sprays as other insects so please garden organically otherwise your new planting schemes will go to waste. 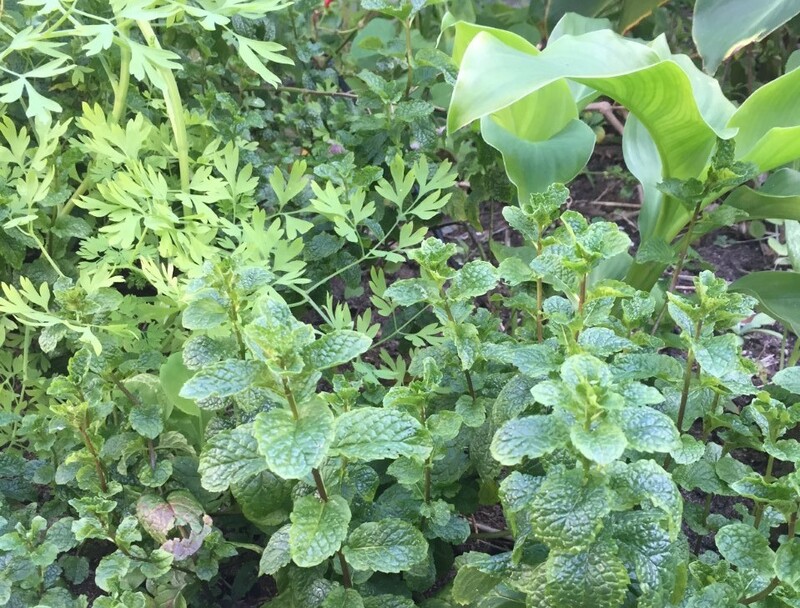 After a year of harvesting your favourite herbs it's understandable that you would try and keep the established herbs you have rather than purchase another collection the following year and wait for them to grow to a suitable size before you can start harvesting. Of course tender species and cultivars such as lemongrass and basil will never survive outside in climates which experience freezing winters, but there are plenty of hardy herb species which with a little help and encouragement will easily pass through the winter unimpeded, ready to supply you with fresh grow as soon as spring appears. In most northern European climates October will be the time to help prepare your herbs for over wintering, although you can probably wait until mid-November in the milder regions of England and Ireland. Cut herbaceous varieties such as marjoram down to ground level removing all of the woody sprigs so all that is left is a tidy carpet of young fresh foliage. Not only will this make your plants look a lot tidier, it will also prevent you from catching the sprigs under your nails when harvesting new shoots over winter. 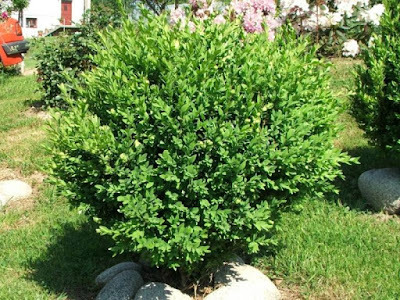 Conversely, leave the pruning of woody herbs such as rosemary and sage until later. The leaves, although looking weather worn, will act as a protective barrier against the worst of the winter weather and insulate the dormant buds below. The old foliage can be pruned off in the spring once the danger of frosts has passed. For a supply of fresh chives over winter dig up and split the clumps, potting them on into compost filled pots. Leave in a porch or cold frame and they will continue to produce fresh leaves throughout the winter. The same treatment will also work for mint. Remove any dead leaves that may have fallen onto your thymes or other small evergreen herb's as this can cause fungal infection. If the weather looks to be getting a little too cold then keep an eye on your bay trees. These will either need to be fleeced up or brought in undercover to a cold greenhouse or porch. This is for their own protection otherwise the top leaves will suffer cold damage turning them brown. It is just as important to make sure that any new grow in the spring is not knocked back by late frosts. This is particularly important for topiary bays as these dead patches will cause them to loose shape. However, should the worst happen, a solid trim and a good nitrogen feed in the spring should bring them back to their former glory by the end of the summer. If you have planted out a specific herb border then the easiest way to ensure winter protection as well as extending the harvest season is to cover the entire bed in a purpose built or makeshift polytunnel. This can be put in place as soon as overnight temperature look to drop below 7 degrees Celsius and then removed in the spring as soon as the risk of late frosts have passed. When deciding on which plants to buy, the overriding factor for most people is not how good they are going to look, it's how they look now that’s important. And to be fair who can blame you, especially when plant retailers are constantly barraging you with nursery fresh specimens, resplendent in seasonal (and sometimes non-seasonal) blooms on a week to week basis. The truth is that flowers sell plants and every nurseryman worth his salt one knows it. However flowers are often short lived and by buying solely on face value you can be missing out on some of the ‘slower burning’ plants that have changing and often just as exciting ornamental effect occurring at differing times throughout the year. With a handful of background knowledge mixed together with a splash of forward thinking you can create some fantastic displays of seasonal colour that are as vivid and spectacular as any flower. The key is in the seasons, and as they change our plants requirements will be changing too and no more so than in the way they make preparations for the oncoming depths of winter. Watch carefully as evergreens can change before your very eyes drawing on brightly coloured pigmentation that helps to protect its foliage from cold damage. 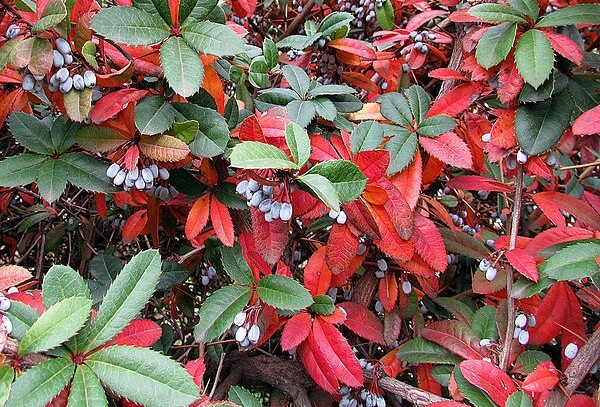 Perhaps the best examples of this are cultivars of Nandina, Cryptomeria, and Berberis - in particular the vicious, yet stunning looking julianae variety. Don’t make the mistake of ignoring deciduous plants just because their displays are shorter lived. Not only are their colours just as vibrant, and in many cases more so, their autumn mortally can make them all the more precious. Perhaps more importantly you can find a far greater selection and range of colour. If its reds you want, you can’t be without the rich, fiery brushstrokes of the Euonymus alatus, Hydrangea quercifolia and Acer palmatum ‘Osakazuki’. 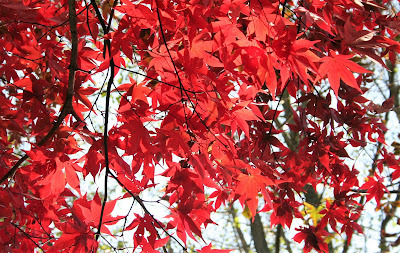 If you are looking for something a little larger then nothing will beat the rich scarlet to almost deep purple autumn foliage of the superb Liquidambar styraciflua. For climbers choose the bold Vitis coignetiae or anything from the Parthenocissus family as all of these will give a great show, although my personal favourite is the more succulently leaved ‘Henryana’ variety. Although rarely considered when choosing a plant for the garden, good bark effect has the ability to bring an autumn/winter garden to life. Not just from maturing trees but from what would normally be considered to be humble shrubs. Perhaps the best ranges of colour from a single species can be found within the Cornus family, especially as it includes one of the few plants to give a near black colouration - Cornus alba ‘Kesselringii'. If you only have space for just the one plant then consider Cornus sanguinea ‘Midwinter Fire’ as, rather greedily, it tries to get almost all the colours onto one plant making it one of the most spectacular choice for the winter garden. 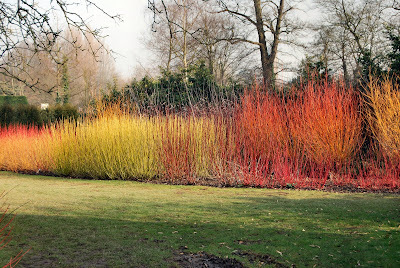 To get the most out of your Cornus cut back, almost to ground level, each year in early spring. For autumn planting schemes I have listed below my favourite selection of plants for autumn colour and to make it easier I have grouped them into autumn flowers, autumn leaf colour for both evergreens and deciduous plants, and autumn fruits and berries. Acer - Jean-Pol GRANDMONT licensed under the Creative Commons Attribution-Share Alike 3.0 Unported license. November is a pretty miserable time for working in the garden. Strong winds, heavy rain and freezing temperatures, these are all good reasons to stay inside, put a blanket over your legs and huddle over a fresh pot of decent coffee - not the cheap stuff. The trouble is that there is work to be done which if you don't take advantage of unseasonal clement weather can result in the loss of plant stock and leave a bigger mess which will be harder to clean up in the spring. 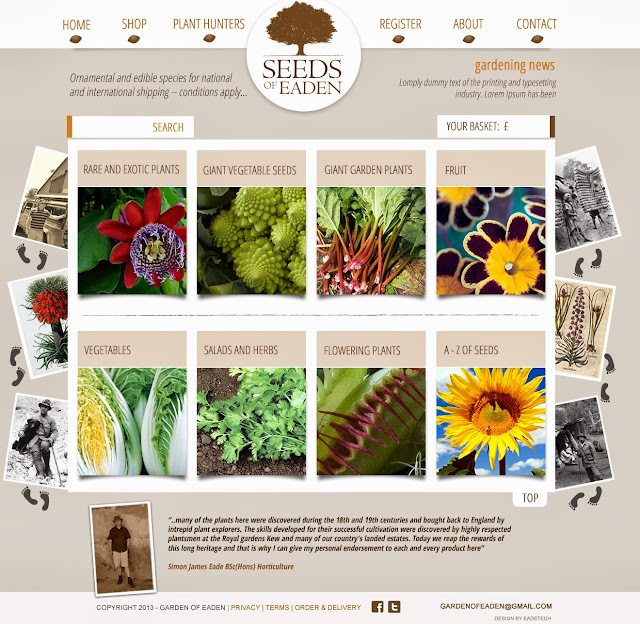 So get your gloves and boots and get started on my chosen gardening jobs for November. 1. As soon as those first frosts appear it will be time to lift and store your dahlias, cannas and tuberous begonias. Only in mild areas can dahlias and cannas be left to overwinter in the ground, but even then the crowns must be covered by a protective layer of straw or bracken. Be aware that by leaving them in the ground there will be a risk of these plants flowering very late the following year. This is due to their exposure to the cold weather. Wherever possible, begonias and dahlias should always be brought in, dried out, and stored for planting the following year. 2. Convert your fallen leaves into a usable leaf mould. Rake up your leaves weekly and store them into large bin liners. When each bag is full, sprinkle inside with water, then give it a good shake and tie off the top. Store in a shady spot and by the following autumn the leaves will have rotted down into a rich, crumbly mixture that can be used as a mulch around the base of your plants. By leaving the leaves to rot down for another year, you will have produced an ideal and natural soil conditioner. 3. With cold weather on its way, insulate your greenhouse using bubble wrap polythene. If available, choose the larger grade as this is specially made for greenhouses. It also contains UV stabilisers which prolongs its life by helping to prevent the plastic from breaking down in daylight. For wooden-framed greenhouses simply pin the polythene to the frame. With aluminium models, use specialised plastic clips that fit into the slots in the metal frame. Consider using lengths of white polystyrene to line inside of the greenhouse hidden under the staging. Not only will this help to retain heat it will also reflects extra light back into the greenhouse. A word of warning though, never use greenhouse heaters next to exposed polystyrene. Not only is it flammable, once alight it can also release poisonous gases. 4. All true alpines originate from mountainous regions high above the tree line. This not only makes them ideally adapted to exposed sites, they are also tolerant of poor soils, and ground that is free draining and extremely cold. However in this country they could do with a little extra protection during our wet seasons, particularly those varieties with woolly or silvery leaves. Try to offer some shelter from the rain, while ensuring good ventilation. Also keep an eye out for alpines plants being smothered by fallen leaves, if left covered your once valuable plants can quickly start to rot.